It is not a shame if you have never heard of the German E-50 tank with the tower replaced by an 128 mm Flak 40. This armoured fighting vehicle is a mere creation of the Chinese modelling company Modelcollect. It is not a historical vehicle, but a so called ‘paper panzer’. The only historical part of the ‘paper panzer’ is the 128 mm Flak 40. 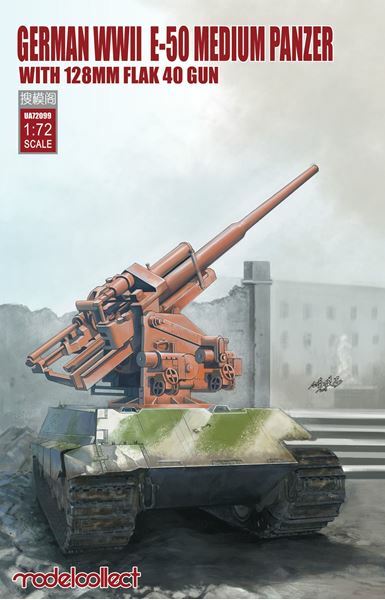 The gun was without any doubt one of the best German anti-aircraft guns in WWII. This heavy gun could fire a shell of 26 kg as high as 35.000 feet, where it would burst apart in a deadly cloud of shrapnel. Some sources even state an altitude of 48.500 feet. This was high enough to take even the highest flying allied bombers out of the sky. Production of the Flak 40 started in 1942. By the end of the war 1.125 of these heavy anti-aircraft guns had been produced, of with 34 double guns for use on specially designed Flaktowers. The Germans also made some attempts to give the 128 mm Flak 40 some mobility. As the power of the Luftwaffe was declining, the need grew for more powerful anti-aircraft guns to protect the Reich against the growing intensity of the allied bombings. In this way the Germans produced a specially designed trailer, but as trailer and gun weighed over 26 tons, this was not a success. In this way, it could have been an idea to put the gun on top of a E-50 hull. The German E-series was an attempt to rationalize tank production. The Germans had so many different types of tanks that logistics and maintenance were a nightmare. Besides, all these tanks and AFV’s were produced in rather small numbers. Under supervision of the Minister of War Production Albert Speer, the Germans took up the plan to simplify all this. The aim was to concentrate on six types of tanks, which would be produced in larger quantities. Each type would use as much of the same parts as the other types, thus simplifying logistics and maintenance. The new tanks would be classified as the E-range, the ‘E’ meaning ‘Einheit’ or ‘Standard’. According to their weight, the E-tanks would be: E-5, E-10, E-25, E-50, E-75 and E-100. The E-50 would have been the successor of the Panther tank. However, the war ended before any of these tanks were produced. The kit comes with a lot of plastic. Not less than twelve sprues are included; eight smaller ones for the hull and four for the gun. Four sprues make up the suspension system and the tracks. The wheels and drive sprockets are nicely detailed, as are the tracks. The latter consist of plastic. It takes some time to build them, but you will end up with a fine track, nicely following the wheels and drive sprocket. The next step is the engine. The kit offers you all parts to make a HL230 Maybach engine, together with its cooling system. 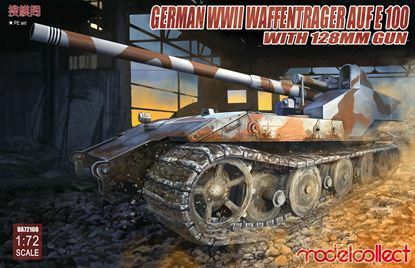 Unlike some other Modelcollect kits however, there is no possibility to show the engine compartment with its hatch open. I would not suggest to try to open the engine compartment yourself, as you will probably end up with damage, rather than a good result. Therefore, it may be a better idea to keep the engine for your scrap box and use it somewhere in a diorama. The hull itself is nicely detailed. Also the tools and cables are included to give the crew the chance to do some minor repairs in the field. 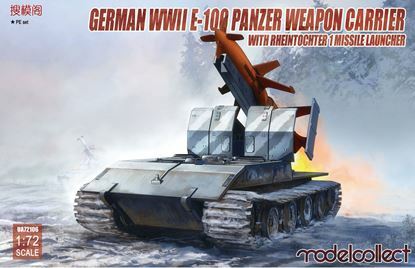 These implements are not always included in other Modelcollects ‘paper panzer’ kits. The 128 mm Zwillingsflak is even a bigger pleasure to build. Modelcollect has done a superb job. Just everything is in place where it should be. All buttons, shafts and rivets are replicated in great detail. If you want to superdetail the kit, you could add some tubes and electrical wiring. With the help of good reference pictures, these can be easily modelled with lead wire. The main eye-catcher of the kit however remains the 128 mm Flak 40 gun, with its impressive barrel. Unlike some other kits in the Modelcollect range, you do not get a metal barrel. You will have to glue two halves together, with the inevitable task to make the joint invisible. Luckily, the parts fit well and give only a small joint. By successively sanding with 2000, 4000 and 6000 sanding paper, I was able to remove the joint quite easily. The same has to be done with the gun’s elevation mechanism and breach blocks. The latter is somewhat more difficult, but luckily the joint in the breach blocks can be camouflaged behind another part.